By the time rescuers finally arrived no one was left alive. For almost a week desperate neighbours had scraped through the rubble, searching for as many as 150 people who lay buried after three homes in a west Mosul suburb were destroyed by coalition airstrikes. The full picture of the carnage continued to emerge on Friday, when at least 20 bodies were recovered. Dozens more are thought to remain buried in what could turn out to be the single most deadly incident for civilians in the war against Islamic State (Isis). Rescuers at the scene in the suburb of Mosul Jadida said they had driven the 250 miles from Baghdad but had not been able to enter the area until Wednesday, five days after airstrikes hit the houses where local residents had been sheltering from fierce fighting between Iraqi forces and Isis. Neighbours said at least 80 bodies had been recovered from one house alone, where people had been encouraged by local elders to take shelter. Rescuers were continuing to dig through the ruins, and the remains of two other houses nearby, which had also been pulverised in attacks that were described as “relentless and horrifying”. The US military said it was launching an investigation. Cololnel Joseph Scrocca, from the US-led command in Baghdad, said “the coalition has opened a formal civilian casualty credibility assessment on this allegation” from Mosul. The destruction took place in a district that was last week a frontline in the battle for Mosul. Locals said militants had positioned a sniper on the roof of the home that had sheltered the largest number of people. It has raised fresh questions about rules of engagement in the war against the terror group, after two recent US airstrikes in Syria resulted in at least 90 casualties, nearly all of them thought to be civilian. The Westminster attacker’s online communications have now become the core of the investigation around the terror raid with security forces keen to ascertain if he was receiving instructions from a jihadist master moments before he unleashed carnage. Khalid Massod was on WhatsApp at 2.37pm on Wednesday, approximately two minutes before ploughing into people on Westminster Bridge and four minutes before he was shot dead by armed officers outside the Palaces of Westminster, the MailOnline exclusively revealed yesterday. Now, Masood’s messages with others on the encrypted messaging service have prompted police to up their search for jihadist associates of the killer. LONDON – The man who killed four people outside Britain’s Parliament was in Saudi Arabia three times and taught English there, the Middle Eastern country’s embassy said. Thousands attended the funeral of a top Hamas terrorist in the Gaza Strip on Saturday, as leaders of the terror group continued to blame Israel for his killing and threatened retribution. Mazen Faqha, a Hamas official freed as part of the 2011 deal to release captive IDF soldier Gilad Shalit and deported to Gaza, was assassinated on Friday evening by unknown gunme. A Hamas official quoted by Army Radio said Israel was “trying to force a new model of a clandestine war on Hamas, as it has failed in the open war model.” He said Hamas would know how to respond to such tactics. Khalil al-Haya, Hamas’s deputy chief in the Gaza Strip, said at the funeral that Israel “will bear responsibility for the killing.” On Friday al-Haya said that only the Jewish state would have had something to gain from the death. The Syrian leadership has sent messages to Israel warning that any further strikes by the IDF on targets within Syria’s borders would be met with Scud rockets fired deep into the Jewish state, the Lebanese newspaper Al-Diyar reported Saturday. The Assad regime conveyed the message to Israel via Russian mediators, the report said. According to the report, Syria warned that Israeli strikes on Syrian military targets would be met with the firing of Scud missiles capable of carrying half a ton of explosives at IDF bases, while an attack on civilian targets would see Syria launching a counter strike on the Haifa port and the petrochemical plants in the area. The report warned that Syria has over 800 Scud missiles and that Syria would not issue any warnings before the missile strikes because Israel does not warn before it hits. PARIS — French anti-terrorism judges have charged two men suspected of involvement in supplying a weapon to the gunman killed at Paris’s Orly airport after attacking soldiers, a judicial source said Saturday. The suspects, aged 30 and 43, were charged Friday for “association with terrorist criminals” over the March 18 attack and are being held in custody, the source said. Ben Belgacem, 39, was under the influence of drugs and alcohol when he attacked the capital’s second busiest airport, according to judicial sources. His father insisted his son — who had spent time in prison for armed robbery and drug-dealing — was not an extremist. Retired Army Lt. Mike Flynn, President Trump’s former national security adviser, met last summer with top Turkish officials to discuss removing the cleric Turkey blamed for last year’s failed coup and delivering him to Ankara, a former Central Intelligence Agency director told The Wall Street Journal. James Woolsey said the meeting occurred in September inside the Essex House hotel in New York. Woolsey told the paper that he arrived in the middle of the conversation, but said the basic idea was a “covert step in the dead of night to whisk this guy away.” The group as reportedly refering to Fethullah Gulen. Woolsey told the paper he found the conversation startling and possibly illegal. But he did not say anything because there were no specifics. Woolsey said he notified Vice President Biden through a mutual friend. 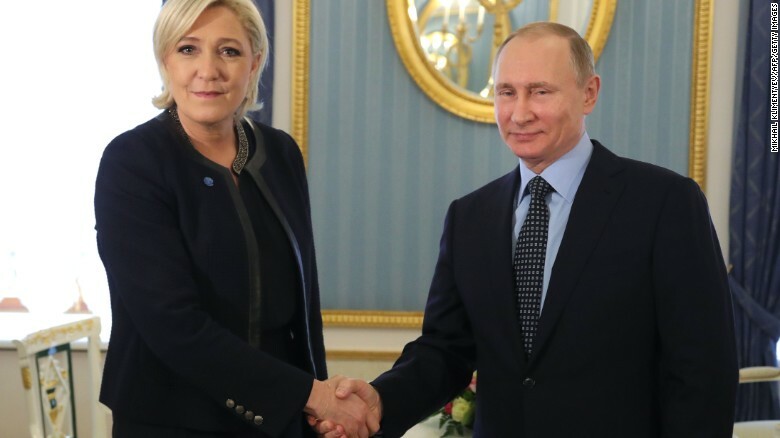 (CNN) Russian President Vladimir Putin stressed the “great importance” of ties between his country and France as he met French far-right presidential candidate Marine Le Pen at the Kremlin on Friday, Russian state-run news agency Tass reported. Putin’s spokesman, Dmitry Peskov, told reporters that Russia was not seeking to influence the upcoming French election but had the right to communicate with French politicians. Russia had no intention of “interfering in anyone’s internal business or electoral processes,” Peskov said. Moscow rejects NATO commander’s remark that it is ‘perhaps’ aiding the Taliban in fighting against US and allied forces. Russia’s foreign ministry has dismissed a US general’s allegations that it may be supplying Taliban fighters in Afghanistan as “fabrications”. Curtis Scaparrotti, the top US general in Europe, said on Thursday that he had witnessed Russia’s influence grow in many regions, including in Afghanistan. In a statement to the Senate Armed Services Committee, Scaparrotti, who is NATO’s Supreme Allied Commander, said Moscow was “perhaps” supplying the Taliban in fighting against US and NATO forces in Afghanistan. ALARM are ringing in Washington after American warships were “harassed” by “aggressive” Iranian forces – who trained their weapons against the vessels. The incident was condemned by US security forces who said Iran had been acting increasingly provocatively and unpredictably in recent months.Despite being in international waters in the Strait of Hormuz, the American ships were aggressively approached by members of the Iranian Navy on Tuesday. Iranian forces trained their weapons on the US flotilla, which was made up of five ships and included the huge aircraft carrier USS George H.W. Bush. U.S.-backed Syrian fighters reached a major dam held by the Islamic State group in northern Syria Friday as Syria’s U.N. ambassador said hundreds of American personnel are “invading my country,” insisting that any effort to liberate the city of Raqqa — the de facto capital of the Islamic State group — should be done in coordination with the Damascus government. The push toward the Tishrin Dam came three days after U.S. aircraft ferried Syrian Kurdish fighters and allies behind IS lines to spearhead a major ground assault on the IS-held town of Tabqa where the dam is located. Tabqa is west of the city of Raqqa. IS has been pounded in Syria in recent months with attacks against the extremists from three fronts, the U.S.-backed fighters, Turkish troops and their allies near the border with Turkey, and government forces in the northern province of Aleppo. The government-controlled Syrian Central Military Media said government forces captured late Friday the town of Deir Hafer, the last IS stronghold in Aleppo province, after troops stormed the town under the cover of Russian airstrikes. Powerful Shia leader demands changes to electoral law at Baghdad demonstration attended by thousands of supporters. Influential religious leader Muqtada al-Sadr has told thousands of supporters in Iraq’s capital, Baghdad, that he will boycott upcoming elections unless the country’s electoral law is changed. Supporters of the Shia cleric have repeatedly rallied for changes to the law and the country’s electoral committee, which is dominated by affiliates of powerful political parties. If “the law remains … this means that we will order a boycott of the elections,” Sadr said in remarks televised at Friday’s demonstration in Baghdad’s Tahrir Square. Iraq is set to hold holding provincial elections later this year, and parliamentary elections in 2018. Sadr, a vocal critic of Prime Minister Haider al-Abadi, did not specify the specific changes he wants to take place, but the current law has been criticised as being biased towards large political parties over smaller ones. Militia fighters in central Democratic Republic of Congo decapitated about 40 police officers in an ambush, local officials said on Saturday, the deadliest attack on security forces since an insurrection in the region began last August. The Kamuina Nsapu militants attacked the police on Friday as they drove from Tshikapa to Kananga. The militia members stole arms and vehicles, Francois Kalamba, speaker of the Kasai provincial assembly, told Reuters. Turkey has condemned Cyprus’ research for natural gas in the island’s Exclusive Economic Zone (EEZ), in a statement from the Foreign Ministry. “These contacts clearly demonstrate yet again how the Greek Cypriot Administration disregards, in its unilateral pursuit of hydrocarbon-related activities, the inalienable rights on natural resources of the Turkish Cypriot people, the co-owners of the Island,” the statement reads, about meetings President Nicos Anastasiades had with natural gas companies in the US on March 22. BELGRADE, Serbia — Serbia’s prime minister pledged on Friday that the Balkan country will never join NATO or any other military alliance as Serbia marked the 18th anniversary of the start of NATO airstrikes that stopped its crackdown in Kosovo. Aleksandar Vucic spoke at a ceremony near a railway bridge in southern Serbia where the Western military alliance’s missiles struck a passenger train, killing at least 28 people and injuring dozens. Anti-NATO sentiments run high in Serbia since the 78-day bombing in 1999 over a bloody crackdown by Serbian forces against Kosovo Albanian separatists. Serbian officials claim that more than 2,000 people were killed in the airstrikes while independent estimates put that figure at about 800, mostly soldiers and police. Some 10,000 people died and 1,660 are still missing from the 1998-1999 Kosovo war that ended with the NATO intervention and the withdrawal of Serbian troops from its former, majority ethnic Albanian-populated province. Kosovo declared independence from Serbia in 2008, which Serbia doesn’t recognize. Although it is a member of a NATO outreach program and is formally seeking EU membership, Serbia has lately been boosting its military cooperation with Russia, which has agreed to deliver fighter jets, tanks and anti-aircraft systems. North Korea claims it has invented a system for secure quantum-cryptographic communications, according to a report from the state-run Naenara news outlet published on Friday. Quantum cryptography leverages the intrinsic properties of quantum theory to secure communications against outside interference or hacking. “The scientists of Kim Il Sung University have succeeded in developing a quantum code communications technology, which makes it possible to open up a bright prospect for blocking various kinds of hacking and wiretapping from their sources by taking hold of its core technologies,” the Naenara report claims. “I’m guessing they are talking about quantum key distribution. These systems are used to establish the cryptographic keys between two parties,” Dr Matthew Rose-Clarke, former Ph.D. researcher at CERN told NK News.